In the third edition of our Beyond Burgers & Fries series we explore our options at Disney’s Animal Kingdom! I should probably be more ashamed to admit that I only have very limited experience with counter service meals at the Animal Kingdom, but I’m not. For me there is one and only: Flame Tree BBQ. With limited options to begin with at this park, it makes sense that there is one that stands so far above the rest. 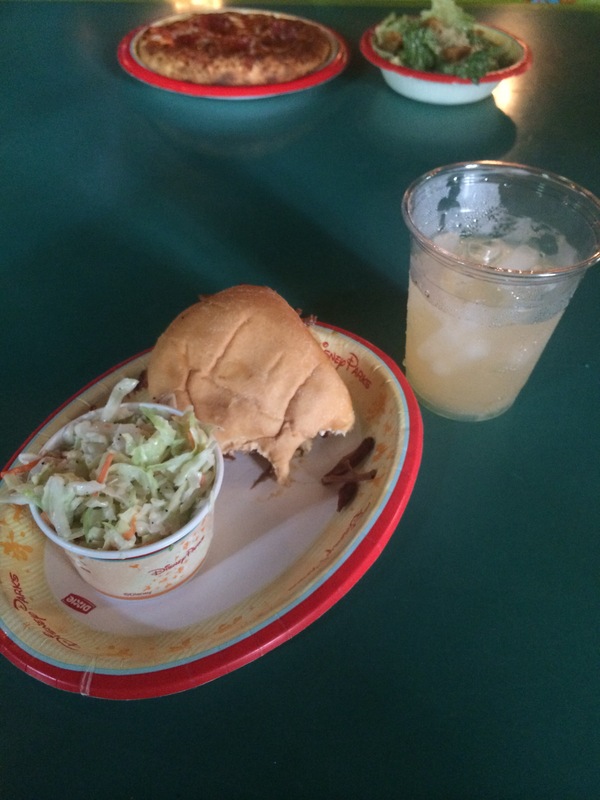 Flame Tree BBQ offers chicken, ribs, and my personal favorite the pulled pork sandwich. The pulled pork sandwich comes with cole slaw (which of course I put on top of my sandwich, the way it should be!) Oddly enough one of the biggest draws for me to Flame Tree BBQ is actually a drink: The mandarin orange lemonade. I’m not sure what it is about this drink, but I have more cravings for this drink than almost any other item from Walt Disney World! An added bonus is that you can have this drink as a specialty cocktail: mandarin orange vodka lemonade! Together these options make for MY perfect Animal Kingdom lunch. Another option at the Animal Kingdom for a good quick meal is Yak & Yeti. Yak & Yeti is a table service restaurant but they do have a quick service called Yak & Yeti Local Foods Cafe. They feature items such as Honey Chicken and a Teriyaki Beef Bowl. While I’ve never personally eaten there I’ve been informed by the other Dole Whippies that a quality meal can be found here! And as always, if you do prefer that burger or chicken nuggets they can be found at Restaurantasaurus in the Dinoland USA area. Restarauntasaurus does also have a macaroni and cheese hot dog and a grilled chicken sandwich that both sound pretty good if I’m ever able to tear myself away from Flame Tree BBQ! Where do you like grabbing a quick bite at Animal Kingdom? We’d love to hear in the comments or on our Facebook page at facebook.com/DoleWhipped ! 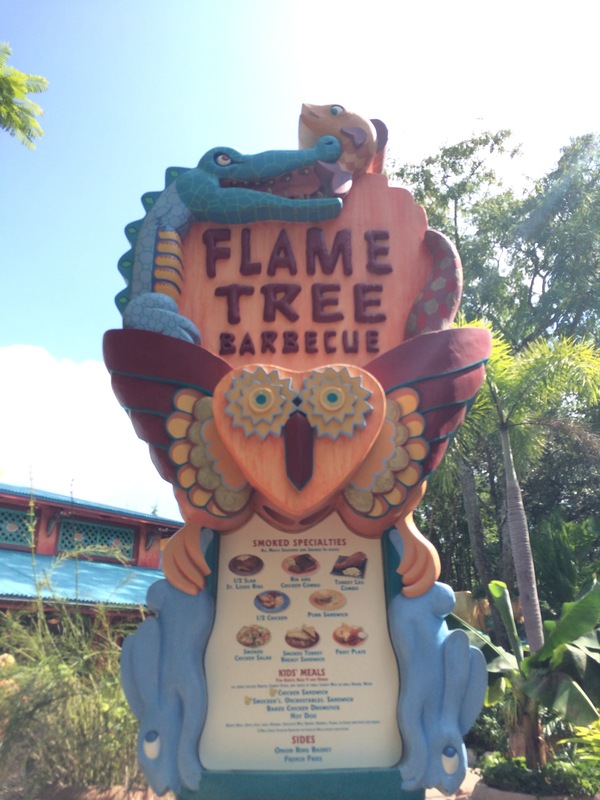 This entry was posted in Disney Dining, Disney World and tagged Animal Kingdom, dinoland, flame tree bbq, quick meal, restaurantasaurus, yak and yeti by Jamie. Bookmark the permalink. I’m so frustrated by the counter service at AK! I don’t like BBQ so I’ve never even been to flame tree. And my last meal at Yak and Yeti CS was just awful. Last time we decided to do the sitdown because we just don’t like any of the CS options.